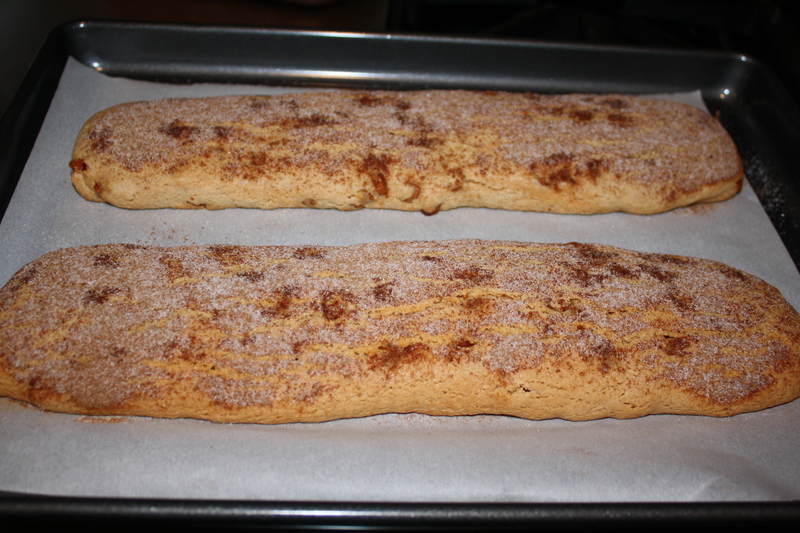 I’ve been making biscotti for several years. The original recipe came from my great-aunt, Ida, through my aunt Fran, but I’ve kind of played with it since then, adding various ingredients and changing the mixing technique to make it more simple. 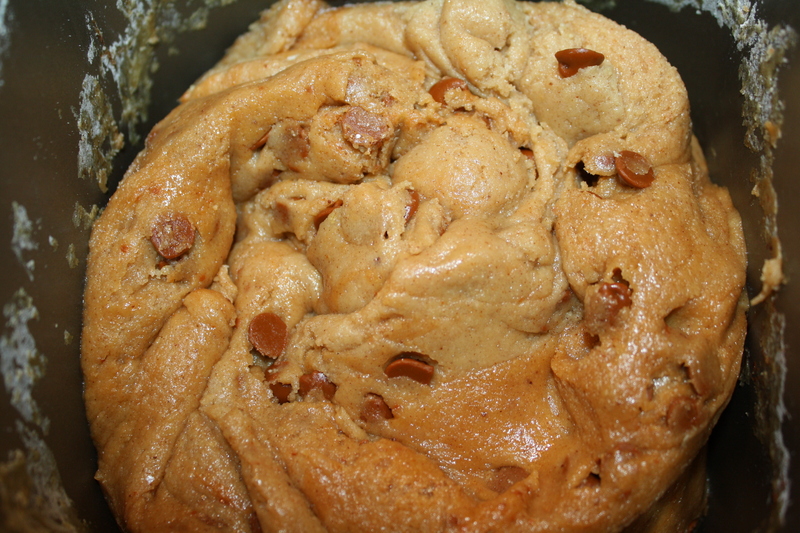 The original recipe is really thick and sticky, and it was always hard on the mixer, so one day I decided to try it in my bread maker. 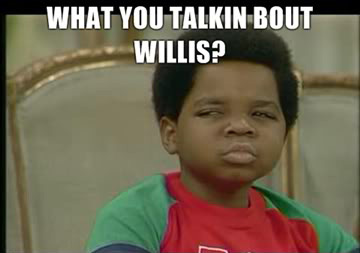 Ever since then, this has been the method of choice for me. Very little mess, easy to mix and remove, it’s really the way to go. 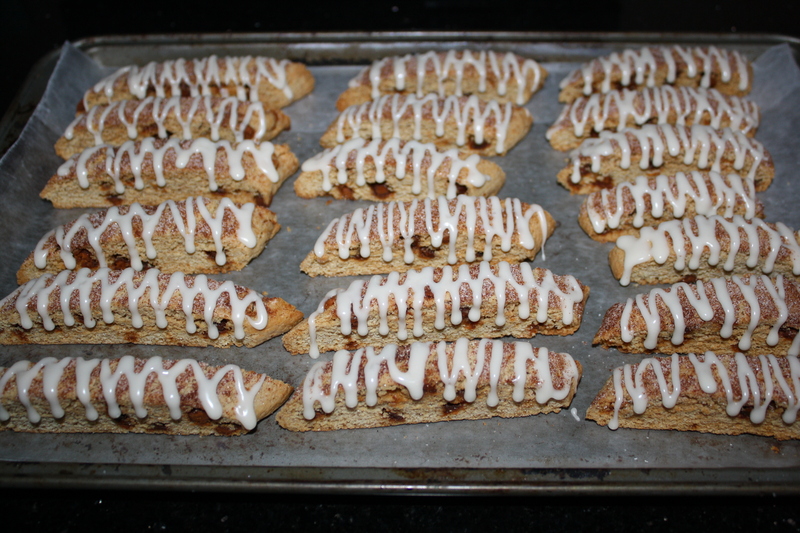 Then a week or so ago, I started to think about doing a cinnamon biscotti, and in order to do that, I took ideas from other recipes and adapted them to the biscotti. 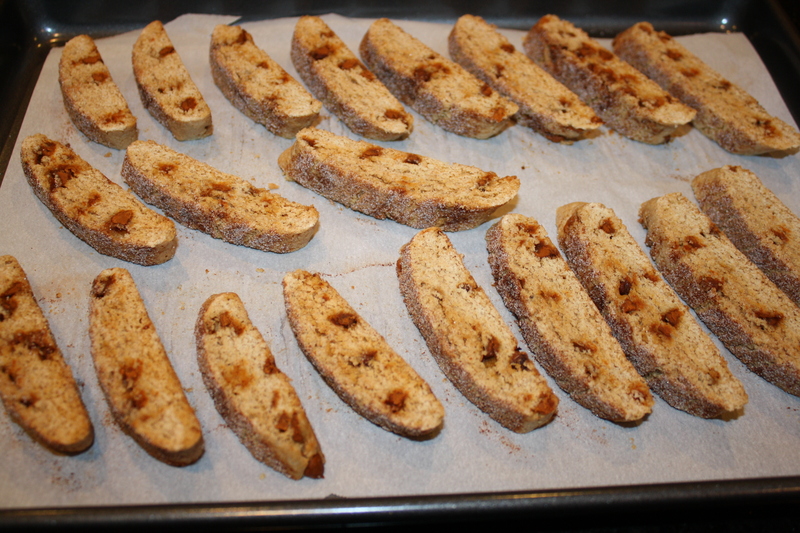 What I came up with, was the best biscotti I’ve ever made. 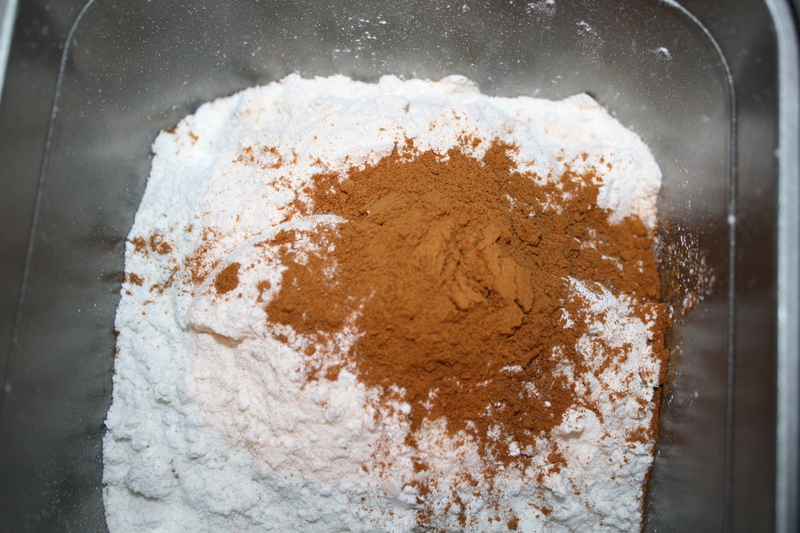 Place ingredients (except for the sugar/cinnamon mixture) in bread maker and run it on the dough cycle. Do not let the dough rise, though. 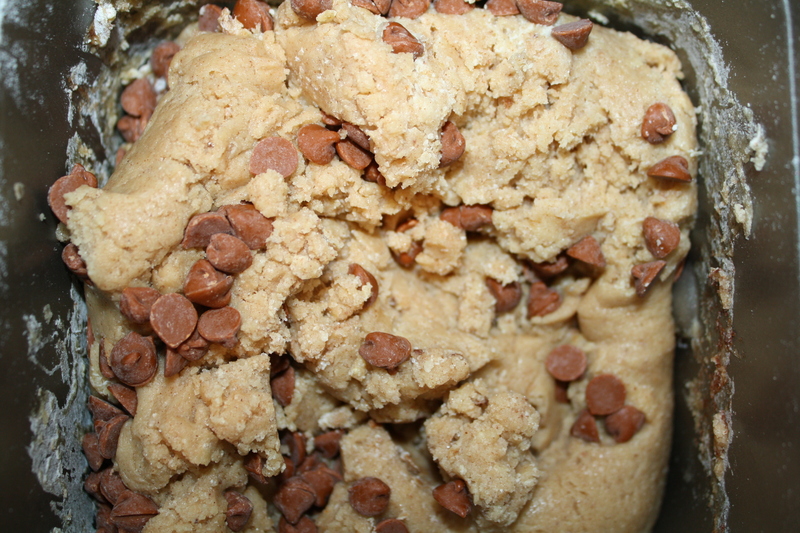 Once ingredients are thoroughly mixed, form three dough balls. 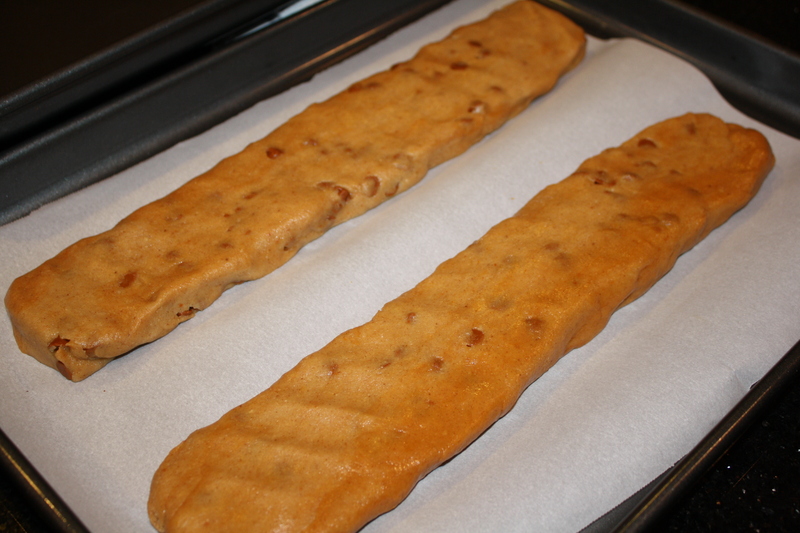 Roll the balls out onto cookie sheets, into loaves, and then flatten. Bake 20 minutes in preheated oven at 350 degrees. You can probably put the ingredients in your bread maker any way you like, but this is how I do it, and it mixes pretty well. 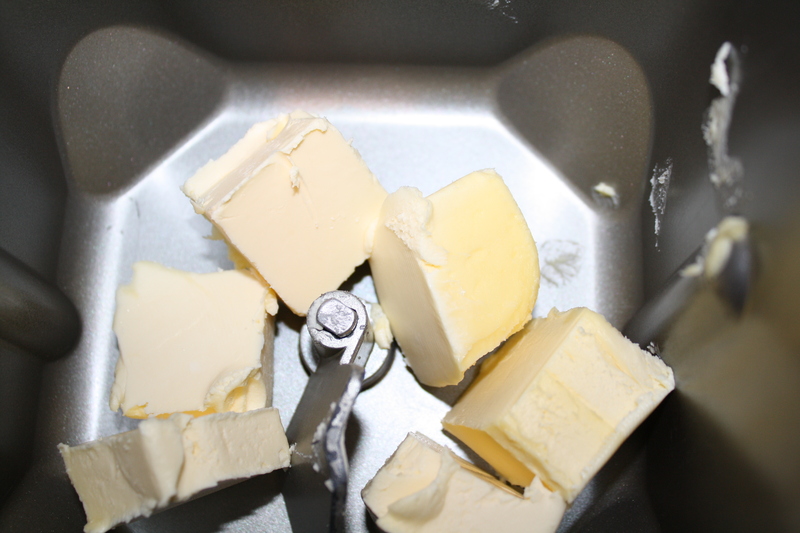 First, put in the margarine, sliced into tablespoon-sized chunks. 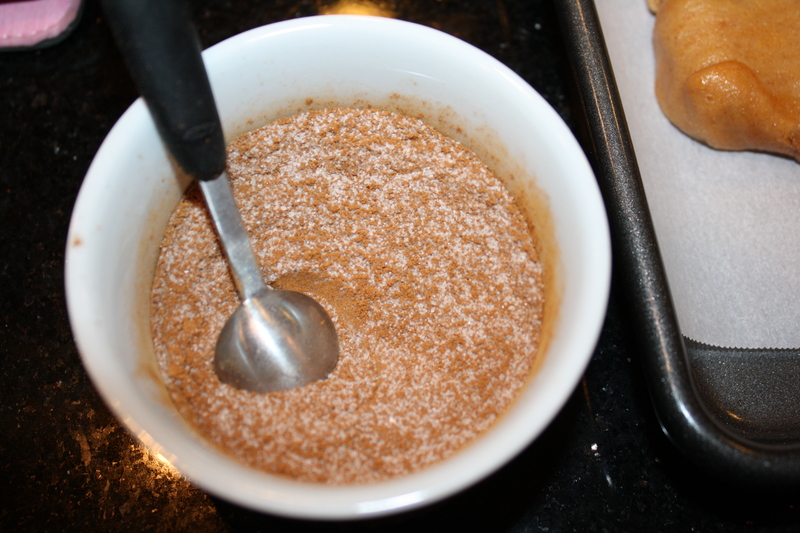 The flour goes in next, along with the baking powder and cinnamon. 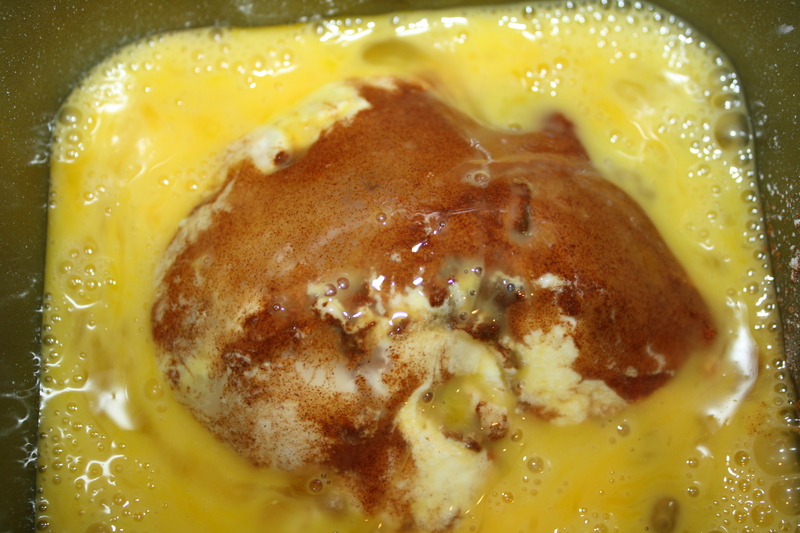 The beaten eggs and vanilla go on top. I let the bread maker work for about two minutes before adding the cinnamon chips, but in subsequent batches, I didn’t wait, and it made no difference. 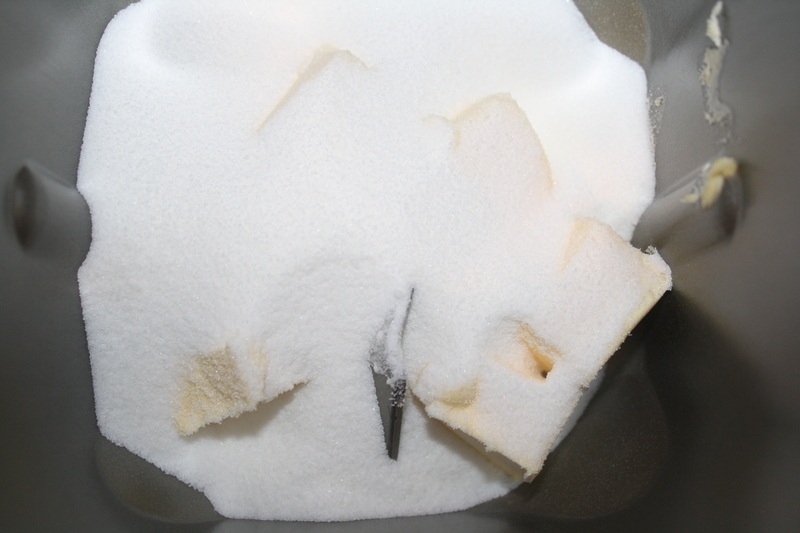 Though I did have to check the mixing process periodically to scrape down the sides of the bowl. This helped to ensure that everything mixed evenly. My bread maker will go ahead and cook the dough, so I have to stop it mid-cycle once the sound of the mixing stops. The dough was then rolled into three loaves. I baked two on one sheet, and one on the other. Parchment paper keeps the bottoms from scorching. 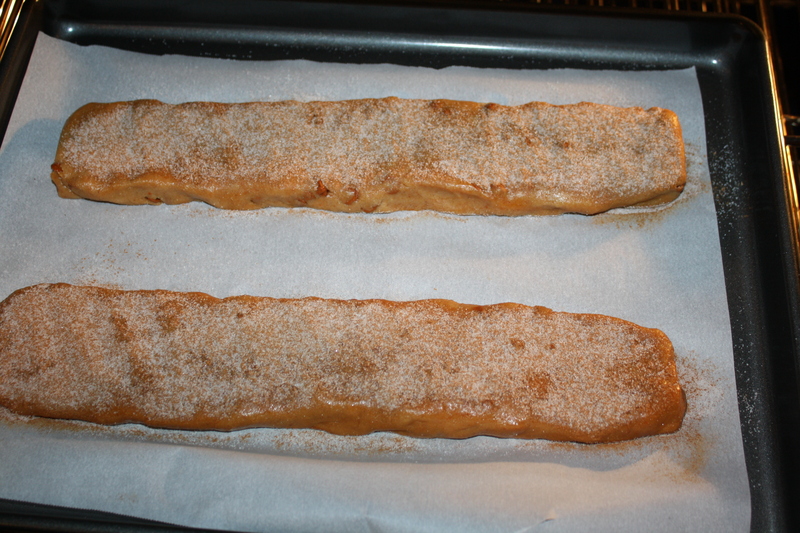 Before baking, I took the cinnamon/sugar mixture and sprinkled it over the tops of the loaves. Then the loaves baked for twenty minutes. After they had cooled for a bit, I cut them into 1/2″ slices and baked them for five minutes, turned them over, and baked them on the other side for another five. First I mixed the milk, vanilla and sugar together, and then right near the end, added the corn syrup. This can be done in a measuring cup or small bowl. Then I put the icing in a decorating bottle and poured it over the slices. Yummy. 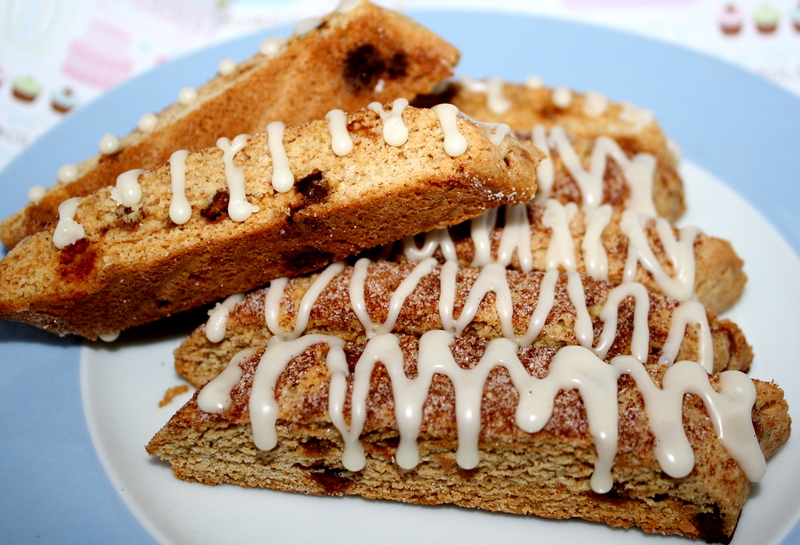 Goes great with coffee or tea, and it tastes just like a cinnamon bun!